Some fifteen or sixteen years ago Tom Brown played saxophone in the concert part of a circus. 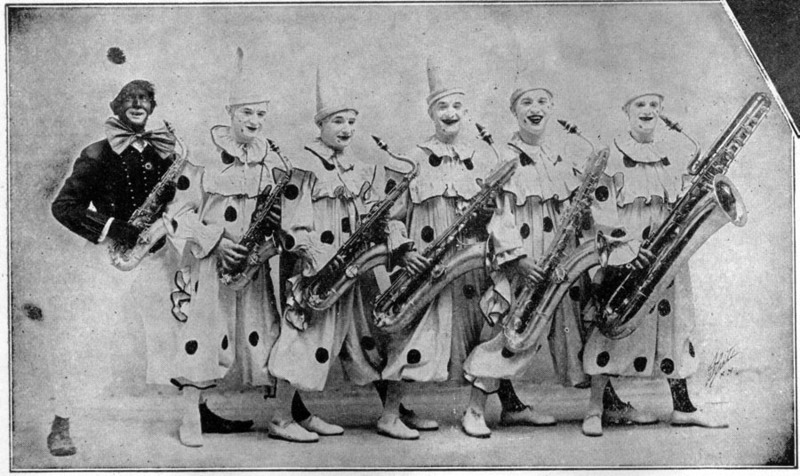 Then he gathered his brothers and Billy Markwith into an act and used brass instruments, then adopted saxophones. Boyer's Music House of New York supplied Tom with a number of Conn instruments. Then Tom began to rise in vaudeville. Later Tom was fitted out with a complete set of Conn Saxophones in gold but Tom himself never played a Conn nor any other make of this country as he started on a foreign make and has kept with it ever since, although a certain manufacturer gold-plated that instrument and has endeavored to palm it off as their make. Bad business. The following wire from Tom Brown is strong enough to convince any one as to what he and his men think of Conn Saxophones and we leave the reader to judge the situation. "Must say Conn Saxophones are just perfect. We are credited with producing a wonderful tone and it is mostly due to the fact that your instruments are made the best and carefully tested. They satisfy the Six Brown Brothers." (Signed) TOM BROWN. 1. C. C. Conn Ltd. Musical Truth, Vol. XI, No. 30, Elkhart, Ind., May, 1922, page 18. Are you looking for BROWN ancestors? If so, we suggest posting a query to our Community Message Board to get assistance from other researchers.